These modules were pulled to upgrade the computer to 16GB. Original Samsung from a Satellite Toshiba laptop, priced to sell. These worked just fine when they were removed from my son’s Apple laptop two years ago. Speed: PC3L-12800S (1600MHz). Capacity: 2Gb. Type: 204-Pin DDR3 So-Dimm. IMac (27" Late 2009). iMac (27" Late 2009. iMac (27" Late 2009) 3.06Ghz or 3.33Ghz. 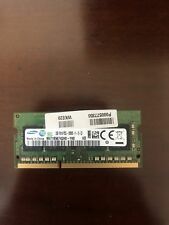 This Samsung 8Gb SO-DIMM kit is for all Apple computers listed above. Price is for 8Gb or 4x 2Gb modules. We strive to provide the correct solution and provide as much information about our parts as we can. ). It is in excellent condition and fully functional. Further specifications can be found below Capacity 2GB. Short Form 2GB(1Rx8). Model SO-DIMM. This is from the fully loaded high-end model (CF-19 MK4). Speed: PC3-10600S (1333MHz). Type: 204-Pin DDR3 So-Dimm. Capacity: 4Gb (2X2 Gb). We always showactual pictures which is for atypical item so you have a clear idea of what you're getting and avoid any surprises. WHY BUY FROM US?. 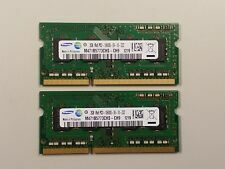 4GB Samsung 2x 2GB DDR3 1333MHz 1RX8 PC3-10600S-09-10-ZZZ-SoDIMM Memory Laptop. Condition is Used. Shipped with USPS First Class Package. Laptop Part Number. We encourage you to select one of the other services provided at CHECK-OUT, depending on how fast you need it. Item Condition. Frequency: 1600MHz. Storage Capacity: 2G. Easily transfer more files with faster transfer speed. Compact and superior quality never let you down. Part number: M471B5773DH0-CK0 (Randomly send). Support for auto-standby, powered-off and sleep modes. You will get ONE randomly selected stick. I think the correct part number is shown in the specifics above or at least in the pictures. These should fit a ton of 21.5" iMacs. Condition - good used, in working condition. Data Transfer Rate 1333Mhz. Pins 204 Pin. Manufacturer Samsung. Capacity 2GB. (256M x 8) x 8. Component Composition. 1.5 / 1.35 V. Rank x Org. Easy to install. Manufactured by Samsung. Samsung HP 4GB PC3 2x2GB 1333 10600 RAM m471b5673eh1-ch9. Condition is Used. Shipped with USPS First Class Package. Speed: PC3-12800S (1600MHz). Type: 204-Pin DDR3 So-Dimm. Capacity: 4Gb (2x2Gb). LISTED 02-01-2019. Your understanding and acceptance of this policy is appreciated. • Speed: DDR3 1333. • Capacity: 2GB (1 x 2GB). • Type: 204-Pin DDR3 SO-DIMM. This memory was installed in a new dell computer and was switched out for more memory. Price include BOTH boards. The modules have scuffs/scratches from normal use and handling (See Pictures). Pulled from a MacBook Pro in full working order. Perfect condition. Tested, 100 % working. Cleaned out my husband's office closet. He's in technology so there's lots of spare ram.